For more than a quarter century, baseball historian Tom Derry has been celebrating Babe Ruth’s birthday in inimitable fashion — and this year will be no different. 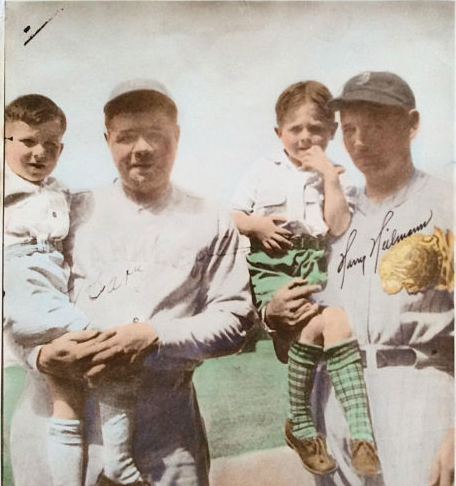 Derry’s 28th annual Babe Ruth Birthday Party takes place Saturday, February 7, 2015, at Nemo’s Bar & Grill in Detroit’s Corktown, just a block east of the old Tiger Stadium site, where Ruth famously swatted his 700th career home run. 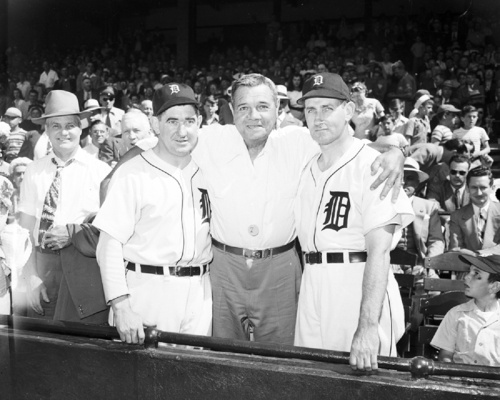 Since 1988, Derry has hosted the original Babe Ruth birthday bash at venues all over metro Detroit, including his own house. 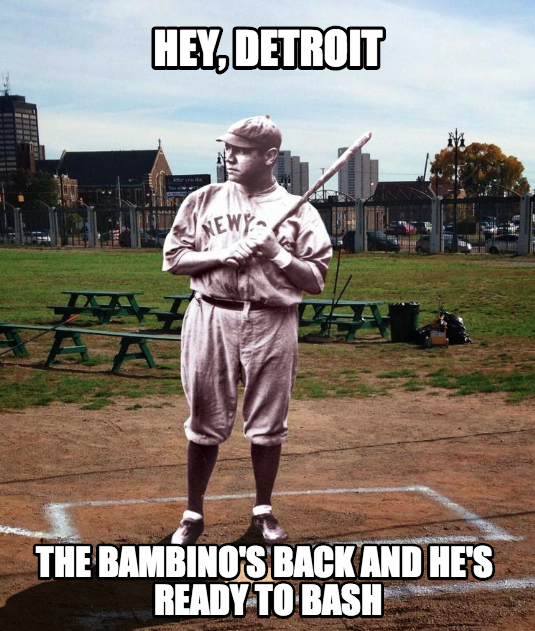 Every year, baseball fans from all over the country flock to this unique event, including members of the great Bambino’s family. This year, we’ll be joined once again by Ruth’s great-grandson, Brent Stevens. Derry and Nemo’s will once again provide partygoers with a Ruthian-sized serving of free hot dogs, Cracker Jack, peanuts, and, of course, Baby Ruth Candy bars. Plus a big birthday cake for the Babe. 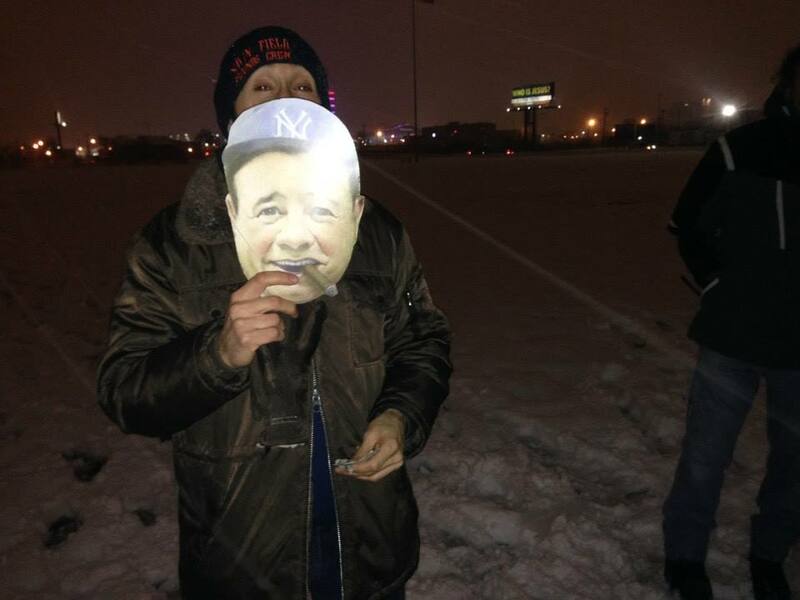 Everyone gets a free Babe Ruth mask and a commemorative party button. It’s the ultimate hot-stove league party! On the night of the party, the world’s largest collection of Babe Ruth memorabilia will be on display. From floor to ceiling, every inch of Nemo’s will be covered with pictures, posters, and quotes about the Bambino. A thousand balloons will line the ceiling, music will fill the air, and the beer will flow all night. This is the way the Babe would want to be remembered! The Babe loved our area and traveled all over southeast Michigan. And, of course, many of his most famous feats on the field happened at Tiger Stadium (then known as Navin Field). As a member of the Boston Red Sox, Ruth pitched against Ty Cobb and Sam Crawford. And after being sold to the Yankees, the Babe hit some of the longest home runs ever (including number 700), right here at the corner of Michigan and Trumbull. So mark your calendars for Saturday, FebRUTHary 7 and come on down to Corktown to celebrate the Babe’s birthday in style. Nemo’s is located in Detroit at 1384 Michigan Avenue, just a block east of the old Tiger Stadium site. Babe Ruth Birthday Party founder Tom Derry does more than just celebrate the birth of the Babe. In 2010, Derry founded the Navin Field Grounds Crew, a grass-roots volunteer group that maintains the site of old Tiger Stadium in Detroit. After the ballpark was demolished in 2009, 6-foot-tall weeds and acres of garbage overtook the site. Under Derry’s direction, the Navin Field Grounds Crew has painstakingly restored the field, cutting the grass and weeds, picking up garbage, and making it suitable for baseball again. Documentary filmmaker Jason Roche has even made a movie about their efforts. Today, tourists from all over the world come and play ball on the same field where Ruth and Cobb and all the greats once roamed. 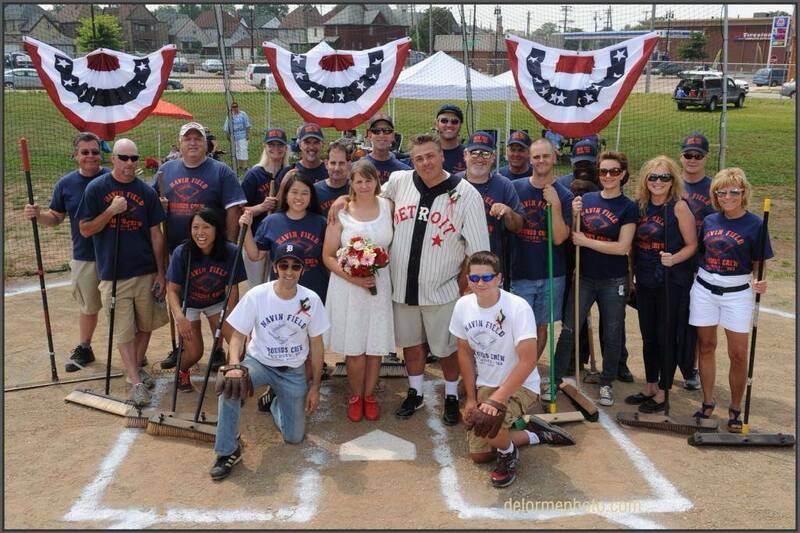 Last summer, Derry and his wife, Sarah, tied the knot at home plate.